These Frosted Sugar Cookie Bars are soft, chewy and topped with homemade buttercream frosting and sprinkles. These cookie bars are made in a sheet pan and can easily feed a crowd. I am a huge fan of sugar cookies. However, I hate how long it takes to make them. Traditional sugar cookies require rolling out the dough, cutting out the cookies, baking, cooling, making frosting and decorating them. That’s just way too much work for me! These Frosted Sugar Cookie Bars have all the delicious flavor and texture of traditional sugar cookies, but with a fraction of the work. I love that I can use a sheet pan for these Frosted Sugar Cookie Bars because it’s easy clean up and makes enough to feed a crowd. 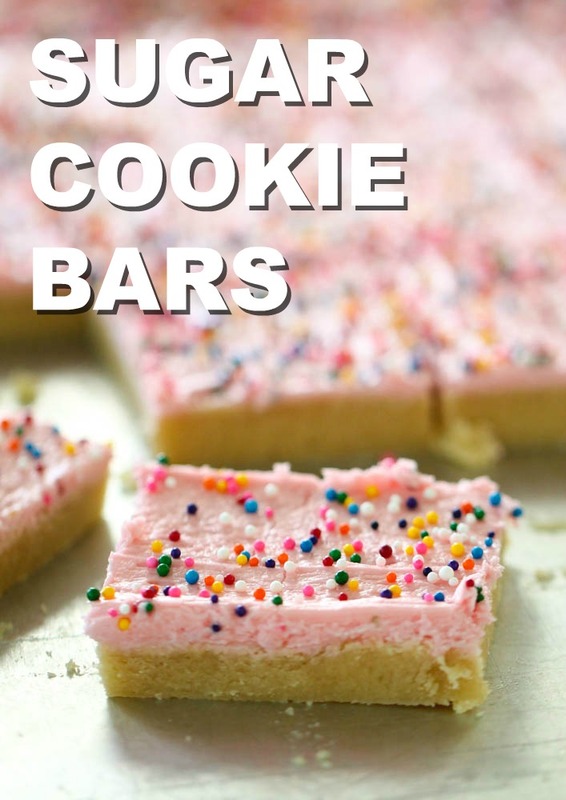 These Sugar Cookie Bars are perfect to bring to a party or potluck and you can change the color of the frosting and sprinkles, depending on the time of year or holiday. These are the BEST Frosted Sugar Cookie Bars I have ever tasted. They are perfectly soft and chewy and the frosting is light and fluffy. 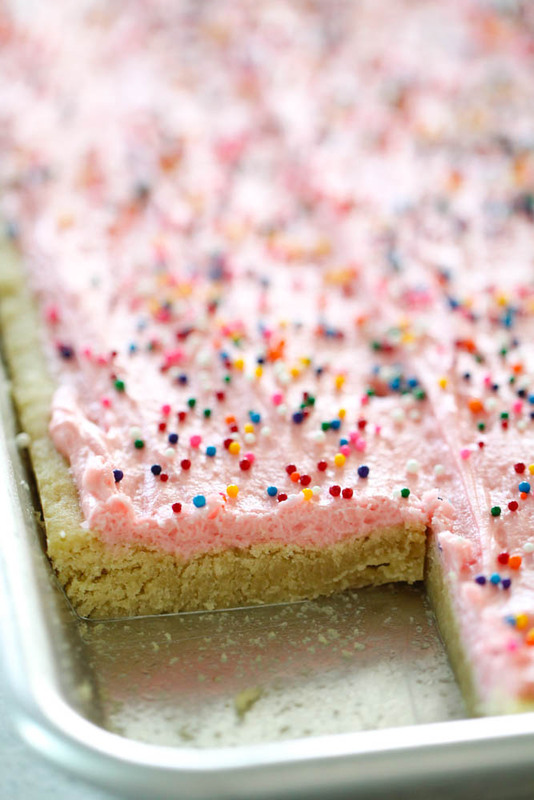 You won’t believe how easy it is to make these Frosted Sugar Cookie Bars. The only equipment I really use to make these is a mixing bowl, hand mixer, rubber spatula and a half sheet pan. While your oven is preheating to 375 degrees F, cream together butter and sugar until light and fluffy. Next, beat in 4 eggs one at a time, mixing after each egg is added. Add vanilla extract and mix until well combined. Rather than sifting the dry ingredients together, you can simply add the flour, salt and baking soda directly to the bowl at the same time and mix until well combined. Press the dough into a half baking sheet that has been sprayed with nonstick cooking spray. The dough will be thick so, using your hands is usually the best way to do that. Bake for 10-12 minutes, or until the bars are barely golden brown. While the bars are cooling, make the frosting by combining all the frosting ingredients and use a hand or stand mixer to beat until light and fluffy. Spread the frosting in an even layer on top of cooled sugar cookie bars and top with sprinkles, if desired. 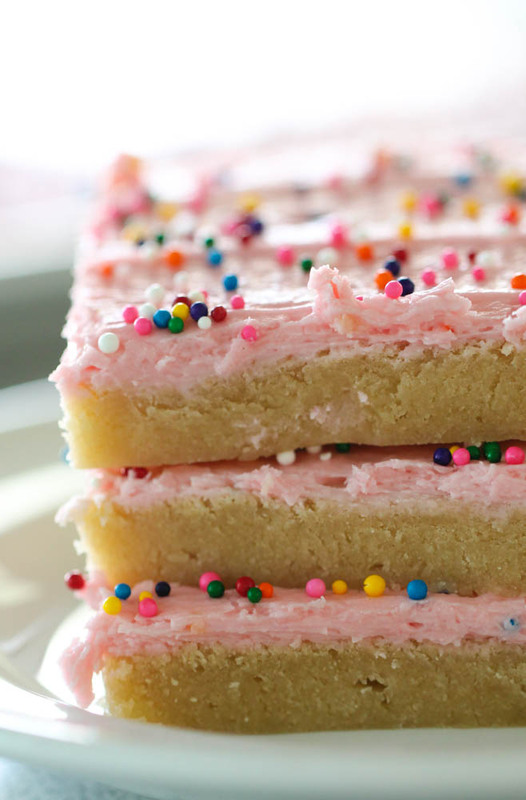 Thick and chewy sugar cookie bars topped with frosting and sprinkles. Beat in flour, salt and baking soda until well combined. Spread and press dough onto a half sheet pan (18"x13"x1") sprayed with nonstick cooking spray. Bake for 10-12 minutes, or until just golden brown; let cool completely. In a large bowl using a hand mixer or a stand mixer, combine all frosting ingredients and beat until light and fluffy. 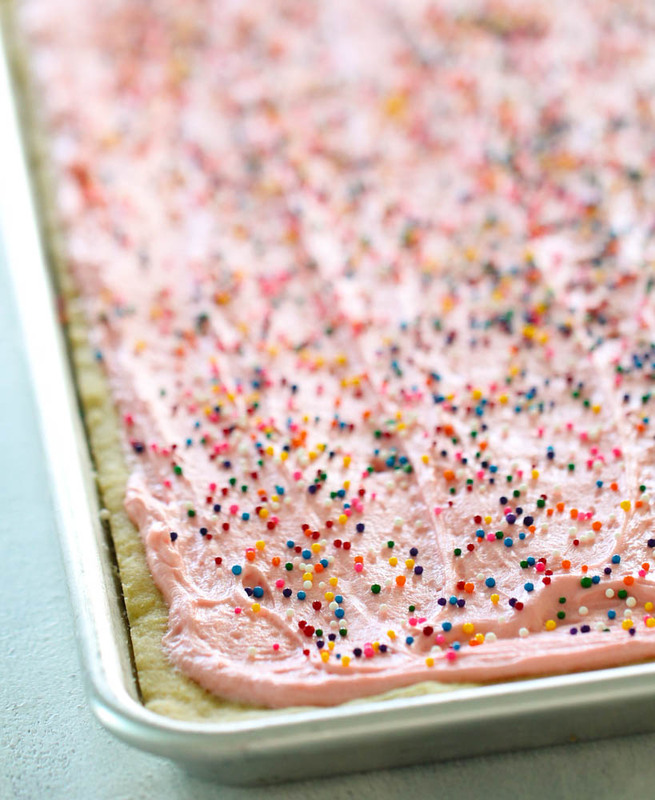 Spread frosting in an even layer on cooled cookie bars and top with sprinkles, if desired. If you love sugar cookies as much as we do, you are going to love these Mini Sugar Cookie Fruit Pizzas. Watch the video below to see how easy they are to make! I love that pretty blue frosting! These look great! Whew, these look ah-mazing! And I understand what you're saying about the whole day project thing, kind of makes me stay away from them as well. But I will definitely be trying these out, they look and sound outstanding! can you still use cookie cutters with this recipe? I love this recipe. I made them last year and I am with you. I may not ever make cutouts again. They look so pretty with the blue and sprinkles. Yummy. Thank you so much for linking up to last weeks show and share. Make sure to come back and link up this week with your latest project. Oh wow! These look great! I can't wait to try them this weekend. The frosting looks devine too! My husband loved these; I didn't frost them and decreased the salt to just a dash and increased the baking soda to 1 tsp. They took 20 mins to cook in my oven and they were delicious! So this morning I decided I wanted to change them to molasses cookie bars (another hubby favorite). So I substituted 1 cup molasses for 1 cup of sugar; omitted vanilla and salt and increased baking soda to 1 tsp. and flour to 6 cups plus added 1 1/2 tsp ground ginger. Sprinkled top with sugar and baked 20 mins. Delicious!! Now I don't have to roll out sugar or molasses cookies anymore. Made these and they instantly became a new family favorite. We will be making these for years to come. Thanks Camille!! You are so very welcome! :) I am glad that you liked them! Yum I love sugar cookies, and am pretty sure I would LOVE those bars! Made these tonight, they tasted yummy. I followed the directions to a T, but the whole cookie turned out dry. I only left it in the oven for 10 minutes. Next time I'll take them out sooner. Also, I followed the icing recipe to a T and put all 4 cups of powdered sugar in and it was sooooo runny. It made the cookie bars a mess to eat because they were so runny. I would have added more sugar to it but I had just 4 cups exactly and I had already run to the store for milk. As I said, tasted excellent! My hubby and I will be snacking on these all week! Quick question, did you store them in the fridge because of the milk and butter in the icing? I made these today and they were SO good. I feel ill because I ate so much. Cooked for 25 minutes and still were gooey in the middle, just perfect. Was going to makes ome for a friend but didn't know if I should refridgerate them overnight or can they sit out given the butter in the frosting? Thanks! I made these and they were SUPER dry... I like my cookies and all baked goods for that matter to be nice and chewy..These were definitely unlike any sugar cookies I'd ever had. More on the shortbread side I'd say. The only thing I did differently was make them in a slightly smaller cookie sheet since I didn't have a 13x18x1. The icing was pretty good though! Be prepared to add more powdered sugar, as it was very runny with just 4 cups. I've made these twice. The first time, I loved the flavor, but they were a little dry. The 2nd time I made them, I left out about 1/4 cup of flour, baked them for 15 min and they are perfect! Also, I didn't use quite as much milk in the frosting. I getting ready to make these for a church picnic (looking for fast and simple). I just thought I'd give my two sense to the ladies who have had trouble with runny frosting and dry dough/cookies. Besides the amount of moisture in the air that also makes a difference (and sometimes altitude) people scoop flour (and powdered sugar) totally differently. I read somewhere (I think in my America's Best Recipes book) that the amount of flour between scoopers could vary up to a 1/4 C per 1 C scoop because of either looseness or packed-ness (I'm surrounded by children and my vocabulary and ability to be brief and concise are totally gone). Anyway, when I scoop flour from my bucket (I do a lot of baking and have a restaurant style food bucket with a snap-on lid) I fluff it up and scoop up the loose flour so that it mounds and give it a good couple shake back and forth so that the flour is level with the top of the cup. Anyway, this comment was $5 big but really only worth 2 cents. I was hoping to use this recipe for a fruit pizza! Do you know if I could roll the dough out a little thinner to adapt it for that? Thanks so much! Thank you so much!! I'll give the fruit pizza one a try!! If you double it, you would need to put it in 2 cookie sheet pans. A double batch in one pan would have a hard time cooking all the way through. I made a batch of these bar cookies last night with my 3-year old daughter. We had so much fun making them together and they turned out beautifully! I did not make any changes to the recipe and not only did the cookies turn out nice and chewy (I cooked them for 10 minutes), the frosting was not runny at all with 4 cups of powdered sugar. In fact, I had to add about a teaspoon more milk to the frosting to make it a little more spreadable. Thank you for the wonderful recipe! Next time we are going to try the peanut butter bar cookies with chocolate frosting. Wow! Made them today. We love sugar cookies but what a pain! These are FABULOUS ! Thanks for another amazing recipe! Just made these for a cookout. They were def a huge hit. Even my diabetic grandfather snuck one! Replaced the 1/2 tsp of bking soda w/ 2 tsp of baking powder and used maple syrup instead of vanilla extract (because I just didn't have any haha). They were both dense (but not extra doughy) AND fluffy. Had store-bought frosting on hand so I just used that. Thank you so much for sharing!! They are different than a sugar cookie. They are a bar and thicker than a cookie. I just made these yesterday with my son. They were OK, but I thought they turned out cake-ier than the ones in the blog post. They were more like a sugar cookie brownie, but a bit dry (maybe like a cornbread texture). Anyway, my kids and their friends didn't seem to mind much LOL. I think I'll try them again after Thanksgiving using a little less flour to see if they end up more like a cookie bar and less like a cake. I just made these cookies, they turned out great. To the comments about them being so dry. You have to measure flour right. You can't shove a cup into a flour bag and expect to get the same results. You need to have a small scoop & put that into your measuring cup then use a knife to scrap off. Again excellent recipe ladies. Just made these for a Christmas goody and used green icing. They are so yummy. Better than sugar cookies! Thanks for sharing. We have a new family favorite! Hi Susan. We are not sure if the store bought cookie dough would be enough to cover the whole cookie sheet. You may need to look at the packaging and see if it gives you options in making it in a bar form. We have only followed the recipe as directed. If it wasn't enough dough, you just may need to buy 2 packages. Sorry we aren't more help. Just made these today they were fabulous! I made the cookie bars as directed and then I just went to the store and bought pre made frosting and colored it! Thanks for posting! They are great! Could I bake these in a regular cake pan? I don't have a cookie sheet that size. Thanks! You will want to find a pan that is close to the same measurements or you would need to adjust the cooking time. If the pan is smaller your bars would be thicker and need more cooking time. I made these for school forma cell report and all 30 kids loved them!!!! THANK YOU SO MUCH FOR THE RECIPE!!!!!!!! These look awesome, I'm just making sure I'm reading right that it's 5 cups of flour for one pan of bars?? I'm curious why the change in flour measurement? I know it's different than what I've made tons of times and they were perfect. I'm regretting not printing the recipe! Was it 5 cups previously? Hi Cammee, we had a lot of comments on the bars being too dry, so we tried the recipe again and reduced the flour by 1/4 cup. 4 3/4 to 5 cups will work. How packed your flour is can also make a difference. These are a family favorite!! I have to agree with the comment that the texture is like cornbread. Didn't resemble a sugar cookie in any way. And a strange flavor. Our sugar cookie bars are thicker and dense. It's definitely different texture than your regular sugar cookie, but that's because it's a bar. Have a great week. I don't have a pan that's 13x18x1, can I use two 13x9 instead? And how long should I bake them for? I accidently baked then at 350 because they went in the oven after a sheet cake. Ten minutes left them nice and soft.. a big hit! Sorry to say, but I made these and did not like them at all. The texture is not like a sugar cookie. The taste is not great either.The proportions are just way off. Maybe too many eggs. The frosting is fine but it is hard to mess up basic buttercream frosting. 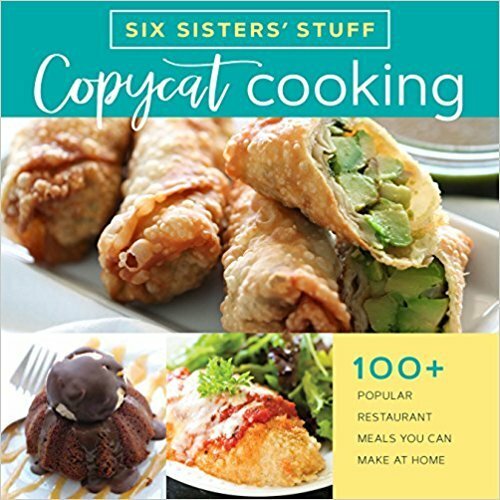 I would not make this recipe twice. I may throw these away. If I eat them it will just be out of guilt because I hate throwing food away. These sugar cookie bars are not as light as a sugar cookie. They are dense. They are a sugar cookie bar. We make them for so many parties and get togethers. There are never any leftovers to bring home. I come back to these time and time again. They are so good! A tip I tried today-"flour" your hands with confectioners sugar to spread your dough out in the pan. This works so much better than non-stick spray, and is tasty too! Hi Kristen. These are one of our favorite recipes on the blog. We are huge frosting lovers and sugar cookie lovers. Thanks for taking the time to drop us a comment. Have a Merry Christmas! These are killer! I have made similar recipes and was unhappy with the results but these are the best. Great way to make cookie bars for bake sales, etc. Suggestion for those that find them a little dry-make sure and beat the eggs and butter for 3 minutes so the mixture is very fluffy. What are the exact measurements of the pan you use to cook them in? If you scroll down to the full recipe, the pan dimensions are listed there. It's a half sheet cookie pan. I want to make these, but should I use real butter or margarine?